No matter what obstacles life throws in front of you, it’s important to keep persevering. This past year has been an incredibly frustrating and stressful year for me. My auto accident back in February kept me sidelined most of the year and I was unable to make any real progress on the film project. Then my cat got sick and died. When I finally got back to the project and decided to hold the NAME THE MOVIE CHARACTERS CONTEST, it took far longer than I anticipated to get the contest started due to circumstances out of my control. I look back on the year and wonder what the heck I accomplished and it, unfortunately, wasn’t much. This year has really tested my patience. But I learned that I can get through those tough times and keep going. I’m as determined as ever to get our wonderful cast together again and I look forward to actually making progress in the new year! It’s important to start audience building as early as possible. 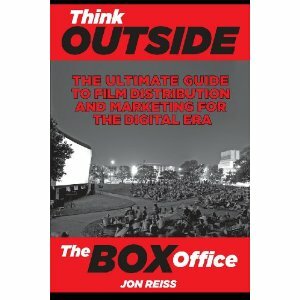 This past summer I attended a Jon Reiss workshop, sponsored by the San Francisco Film Society, entitled Think Outside the Box Office. This workshop was named after Jon’s book of the same name. While I had always thought that it’s important to build an audience early, Jon’s workshop was the first time I had ever heard anyone else say it. Jon advocates starting to think about the distributing and marketing of one’s film from as early as inception. A vital part of this is reaching out and growing the audience. It may seem counterintuitive to start at inception, especially when, traditionally, most filmmakers wait until after they finish the film to think about distribution and marketing. But it really makes a lot of sense if you think about it. Independent filmmakers don’t have the huge marketing budgets that the studios have to reach their audience, so anything indies can do reach and build an audience as early as possible will only help down the road when it comes time to market and distribute the film. Many of you have followed me from The Invisible Man Online website over here to Shoom Zone. If there is anyone who wants to see our beloved cast together again, I know it will be I-Man fans! So far, a small group averaging about 1,000 readers a month visit this site; and so many of you have been openly supportive and encouraging. I can’t thank you enough for hanging in here after all this time. But I, also, can’t assume that all of the audience of 10 million people around the world who watched I-Man will easily find out about this project or even be interested in it. I’ve got my work cut out for me to reach all those fans and to even try to extend the audience to the general sci-fi/superhero audience. I need to prove to investors and distributors that there is a big enough audience to justify the cost of making this movie. But I can’t do it alone. I’ll need your help to spread the word about this project. In the future, I’ll be expounding more about ways you can help, but for now please check out the How Fans Can Help page for some ideas you can do that are absolutely free. I recently updated it with new ways you can help out. Interviewing is a great way to learn about subjects. I’ve already done one interview for the United Filmmakers Association and will be starting an interview series in the near future on distribution companies for them. Prepping for the interviews is forcing me to start learning about the distribution process (a good thing) and then getting my questions answered means learning about the distribution companies. It’s a fantastic education! I already have my first interview lined up. I’m just waiting to resolve some computer issues right now which are preventing me from downloading video. Yes, I said video. I recently bought myself a little Flip video camera which will allow me to shoot the interview. So look forward to seeing more video in the future! Now I need to learn to edit! A good thing to keep in mind as I develop this project!